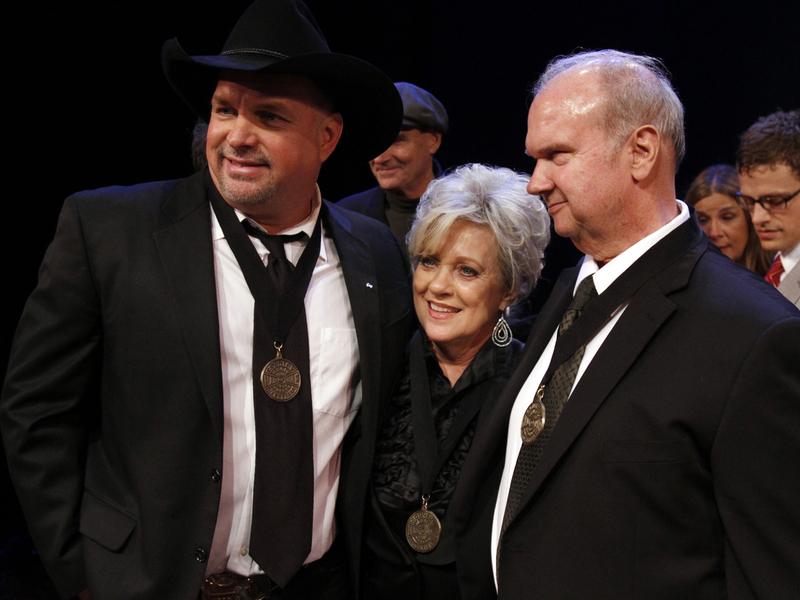 Garth Brooks promised he'd be emotional during his Country Music Hall of Fame induction. But the tears started before he made it all the way into the building. Reflecting on personal heroes George Strait, Bob Seger and James Taylor on hand to salute him Sunday night, Brooks teared up as he spoke with reporters on the red carpet. He only got more emotional as the night went along. "I moved to this town for one reason and that was to get 'Much Too Young to Feel This Damn Old' cut by George Strait," Brooks said before the ceremony as his eyes began to redden. "That's what George is singing tonight. It's gonna be so cool. I'm a fan. So I get to be a fan tonight." Tributes poured in throughout the night. "What I love about Garth is his passion," said Seger, according to The Tennesean. "Even with his enormous success, he's still a really good guy." Kyle Young, director of the Country Music Hall of Fame and Museum, said, "Whenever the topic turns to Garth Brooks, people inevitably talk about how he changed country music," said Young. "Garth did not change country music. Like every important artist honored in the Hall of Fame, Garth Brooks is country music. But Garth Brooks did change American culture. He proved that there were no barriers to how many hearts and souls country music could touch." Brooks was inducted along with trailblazing singer Connie Smith and keyboard player Hargus "Pig" Robbins, whose rolling signature sound has adorned countless hits across the radio dial. It was a night studded with stars. Strait, Seeger and Taylor played for Brooks, dubbed "the mighty Garth" by Robbins. Lee Ann Womack, the Quebe Sisters and The Whites saluted Smith. Merle Haggard provided her induction speech. Ronnie Dunn serenaded Robbins with a version of George Jones' "White Lightning," the first No. 1 hit Robbins played on in 1959, while simultaneously drinking moonshine from a Mason jar. Ronnie Milsap, who like Robbins is blind, joked "Pig and I are driving home tonight," before joining Robbins on "Behind Closed Doors." Robbins is one of the most widely recorded session players in Nashville history, though his reputation spread far beyond Music City's borders. From Jones and most of his country contemporaries to rock 'n' roll pioneers like Bob Dylan, Neil Young and J.J. Cale, he worked with some of the most dynamic artists in music history. Smith recounted before the show how she won a talent contest in Columbus, Ohio. Bill Anderson heard her sing and less than a year later she had her first hit, "Once a Day," which became the first debut single by a female country artist to reach No. 1. It sat atop the charts for eight weeks. Wherever they decide to hang Brooks' plaque will quickly become the most visited spot in the museum. Selling out stadiums, drawing more than 750,000 fans to Central Park, hosting "Saturday Night Live" and earning his own TV specials, Brooks rose from playing for tips in Oklahoma bars to becoming a pop culture phenomenon who started fashion trends, changed the concert business and is still imitated endlessly despite a decade of semi-retirement. Name just about any trophy, lifetime achievement award or honorific, and Brooks can claim ownership. He balked, though, when informed he'd be inducted into the Country Music Hall of Fame last spring because of all the greats he thinks should go in ahead of him. But there's no denying Brooks' place in not only country music history, but American pop music as well. The third best-selling artist in U.S. history with more than 128 million albums sold, he helped take an oft-maligned genre of music to the world. As Strait said during his induction of Brooks: "He blew it up, man." And fans are still breathless in his company. Hundreds lined up outside the hall of fame in anticipation of the 50-year-old singer's arrival with wife Trisha Yearwood, holding signs and cheering. The shouts were just as loud during the ceremony. Brooks gave a speech that included thanks to friends, family and industry professionals who helped him along the way. And he told the story of how Taylor, Seeger and Strait affected him at the points they entered his life. He remembered hearing Strait for the first time while visiting home after his freshman year in college. "Unwound" came on the radio and it changed everything. "From that point forward I knew what I wanted to do with the rest of my life," Brooks said. "I wanted to be George Strait so bad, man. And I have to say now, 20 years in the business under my own name, thank you very much, I still want to be George Strait so damn bad." "When I came out here, Vince Gill looked at me and said, 'This will be the greatest day of my life.' And he was right," Brooks continued. "It was the best day of my professional life."